this week we travel back to the very genesis of pleng luk thung, with the immortal khamron sambunnanon. 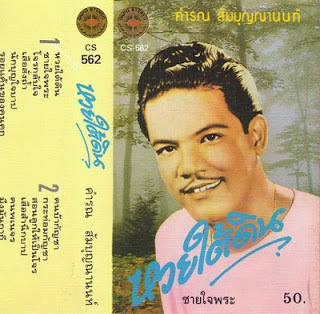 dating from the late 1930's, this sort of music was known at the time simply as เพลงตลาด ("pleng talat" or "market songs"), and while the instrumentation is of the same "modern thai" style heard in the urbane luk krung, the lyrics provide the precedent for the sort of social consciousness that defines luk thung. khamron's songs were among the first to address the underclass of thai society; his characters are often gamblers, bandits, vagabonds, and ganja addicts. this is a very old tape, and while the tunes in some places threaten to vanish under a blanket of warm distortion, it's a true historical document, and the songs are wonderful as well! I'd like to express my most sincere thanks fot this blog, which is the best opportunity on Internet to get aquainted with the old-school thai music. Also, some links are dead now (including this one). Maybe hosting the rips on Rapidshare is the best solution?